THIS POST HAS BEEN UPDATED - YOU CAN FIND THE NEW POST HERE. This post is the fifth in a five-part series (I. Projection, II. Base Maps, III. Color Selection, IV. Symbology, and V. Legends) which will look at various GIS tools and methodologies utilized by Stratasan. Titles display the purpose of a map, scale bars display the distance on a map, and sources explain where the data used on a map originated, and legends identify the attributes on a map. All of these features are the important final touches on a map that make it readable and useful. They help the person looking at the map understand all of the various layers and attributes we have discussed in the previous posts in this series. The presentation of a map is the final, and essential, part of the map-making process. The title of a map shows its purpose. It tells the map reader what they are looking at and why. At Stratasan we like to center out titles and have them take up no more than two lines of text. We like using a bold, easily readable font. Scale Bars help viewers visually understand the distances on a map. There are multiple ways to display scale on a map: a representative fraction (e.g. 1:32,000), a verbal scale (e.g. one inch to 10 miles), or a bar scale (which is like a distance ruler on the map). At Stratasan, we use a bar scale because it is an easy and effective way for map readers to perceive distance visually does not require a strong knowledge of map scaling mechanics. Our standard is to place our scale bars at the bottom left of the map where they are easy to find and use, but are out of the way from the rest of the map attributes. The data sources used for in creating the map should always be displayed on the final product. We use a small (10-12 point) font that shows where and from what year the data was derived. As with the scale bar, we place the source information at the bottom left of our maps. Map readers can find this information easily without it cluttering the map. Legends display the meaning of the most important attributes on maps. Legends include the attributes on a map that are not inherently understood. Layers like roads, counties, or labeled icons are usually omitted from the legend since their meaning is evident. Including these attributes would only take up room in the legend box. In our maps at Stratasan, we put the representative symbols of each attribute on the left side of the legend box and their definitions to their right. Ordering of attributes in the legend is of critical importance. Items should be ordered by their placement on the map and by their importance. They should also be organized to keep the profile of the legend box as small, and out of the way, as possible. Like the scale bar and data sources, we tend to place our legend box in the bottom left corner of the map. It should be noted that we DO NOT use a North Arrow (Compass Rose) in our maps. Almost all maps that are used are aligned north to south; we believe that a compass rose should be placed on maps only if north is not at the top of the map. The addition of a compass rose is almost always a distraction that takes away from the real purpose of the map. 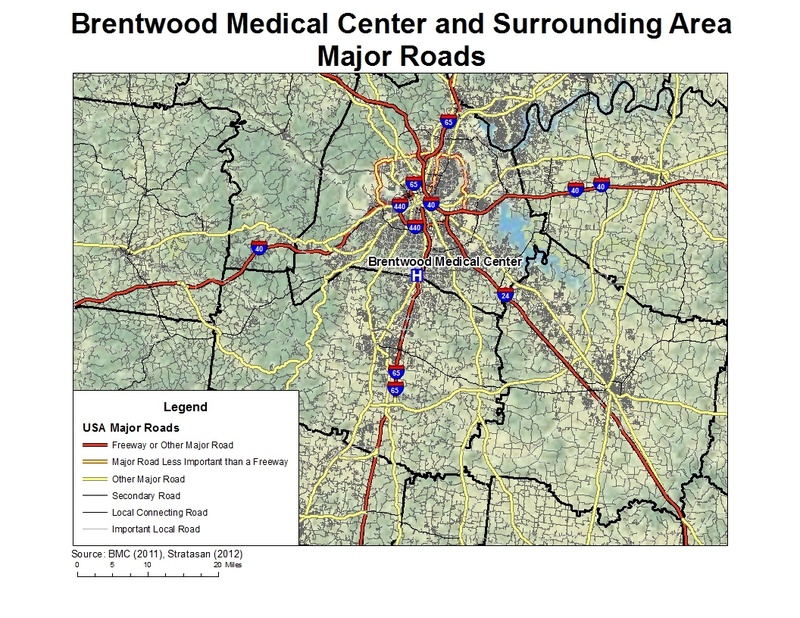 This map of graduated symbols representing patient revenue also displays roads and the location of Brentwood Medical Center. 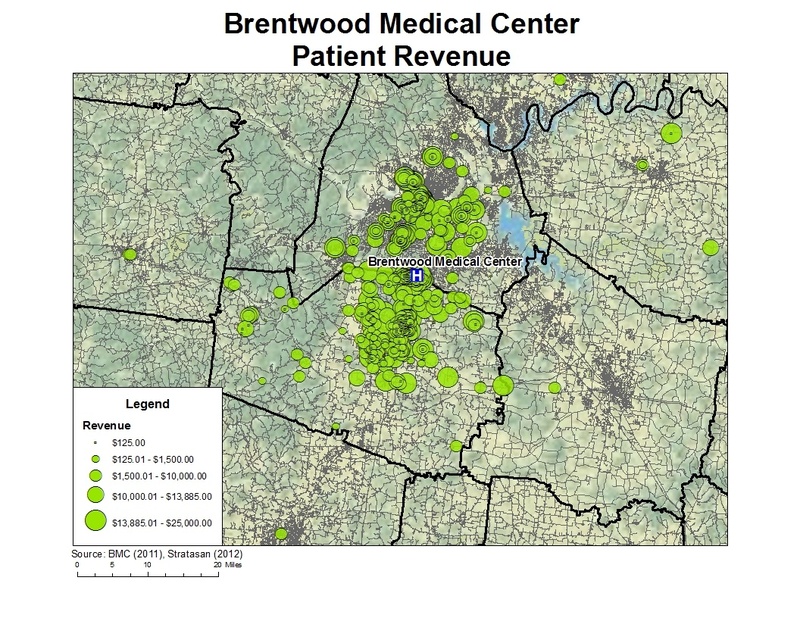 These two features don’t need to be explained, however, the patient revenue symbols do. Therefore they are included in the legend. They are aligned top to bottom from lowest to largest revenue. Since the values given do not explain the attribute, a “Revenue” header was included so that the map reader could better understand the meaning of the symbols being used. This map of roads follows the same concept as the previous two maps except instead of displaying quantitative values, this map is displaying line attributes from most to least important. As above, this illustrates the concept of displaying the data in your legend from most important to least important attributes. Titles, scale bars, sourcing, and legends are the final touches that we add to a map. 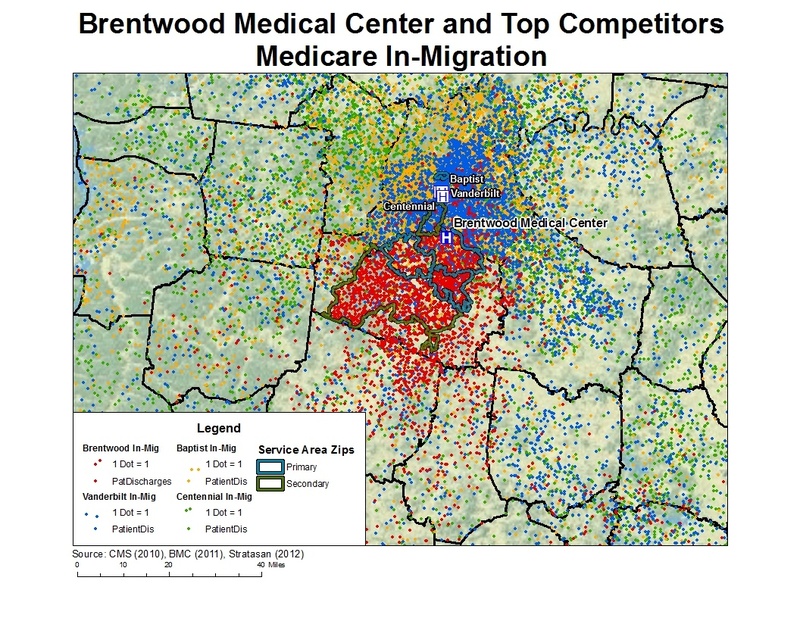 This process is critically important when mapping healthcare patients, hospitals, service areas, and all the data that comes with them. If a map does not give the reader the information needed to understand what the map is displaying, the cartographer behind it has failed. At Stratasan, we take our GIS and cartographic responsibilities seriously. 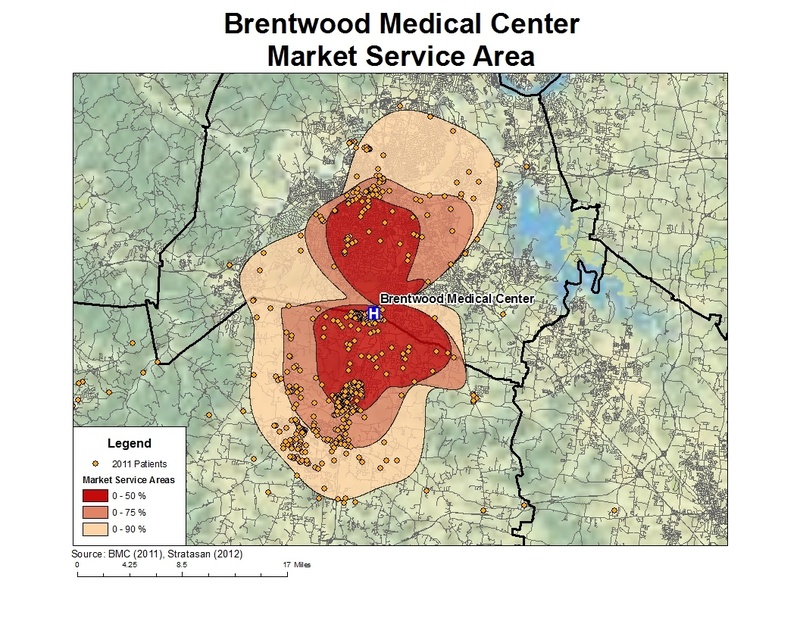 The maps we make must be maps that our customer can read and comprehend quickly and easily. Without using the principles outlined in this series of posts, our maps would not be as effective and informative as they are today.